This entry was posted in Travel Photo of the Day on October 16, 2013 by adamjbianchi. Khayelitsha, one of the many townships of Cape Town, South Africa is a sea of aluminum walls, echoing laughter and soccer balls. Almost two years ago, I was there on a bicycle tour. In the townships, cars are rare, but traffic still exists. The streets are lined with women cooking, boys fighting, children begging, and endless chatter. As we passed by, the faces turned towards us. The confusion, judgement and hatred could be seen in each of their faces—the air was riddled was tension. I met the gazes of these locals and did my best to not butcher ‘hello,’ in Xhosa: molweni! As I rode on, I tallied the smiles and waves. Khayelitsha is the face of urban poverty, inequality and racism. Despite the politicized and marketed strides of a post-apartheid South Africa, the reality is that some eleven million people still live in townships today. During apartheid, the townships were intentionally segregated communities for the black population of South Africa. Although today, the segregation is no longer enforced by the government, it lingers on. In my time in South Africa, the only whites I saw in the townships were tourists. It was in these moments that I truly learned the depth of the world’s issues, and the immeasurable value of travel. Since my time in South Africa, I have traveled to some 35 countries (and counting). I have seen slums, rain forests, palaces, volcanoes, dungeons, waterfalls, and way too many churches. But what I value the most about my travels are the memories that are tattooed onto my soul, the memories that so quickly turn into life lessons. One of the most important lessons I learned on my travels stems from a memory formed in the heart of Khayelitsha, during a home stay that I participated in with my study abroad program, Semester at Sea. While on Semester at Sea, I had the opportunity to participate in multiple home stays. These experiences are so important to understanding other cultures and I always recommend them to anyone traveling and not vacationing. Home stays are the perfect ice breaker to culture-awkwardness and almost always kindle an everlasting connection. In Khayelitsha, my host mother, Mama Knox, proved herself to be nothing shy of a superstar. She was independent, incredibly strong and so kind. Mama Knox was the only host mother willing (or maybe able) to accommodate my vegan diet, and she was sure to tell me how uncommon my diet was. As we shared stories, I came to know, love and respect Mama Knox within only a few short hours. But it was in the few short minutes before I left the next morning that I came to realize how very wrong my assumptions of her life were. The next morning, as I was saying goodbye and preparing to leave, I noticed two magnets on Mama Knox’s refrigerator that prompted a double-take. These magnets read: How to Reduce Your Carbon Footprint & How to Save Water. My shock was not due to the message that these magnets were sending, it was due to the setting in which I found them: a township. Despite everything that Mama Knox had told me, her stories, all that she had overcome, I did not expect the environment to be on her list of concerns. This was because my education had taught me that the majority of environmental degradation was done by the wealthiest, and thus my conscience told me that it was then the wealthy who should fix it. For this reason, I expected her and so many others in her community to be so caught up in trying to escape poverty that they didn’t have time to be activists. What I didn’t consider was that saving the environment, escaping poverty, ending racism and the rest of the world’s problems are all interconnected—because we are all interconnected. We are one species, and despite our countless flaws, we must unite to truly make a difference. I know now how embarrassingly wrong my assumptions were. But the shame of my ignorance is what prompted me to permanently change the way I see the world. For in that moment, I began to understand that the inhabitants of this earth have so much more in common than not—and the fact that we believe otherwise is the single largest obstacle preventing us from making deep and lasting change. I can honestly say that in all of my travels since then, I have had equally humbling moments, and sometimes even more embarrassing realizations of my own ignorance. My travels continue to remind me that I know little to nothing about the world in which we live, but the people I meet continue to remind me of what a blessing that truly is. For although many times travel requires me to fly, it is the one thing that continues to keep me grounded. You can follow more of Marissa’s travels on Instragram. This entry was posted in Guest Posts on October 8, 2013 by adamjbianchi. Photo series can be a great way to document your travels. They are easy to do (once you pick your specific thing) and they look good all together on your fridge, in a scrapbook, or in a facebook album. Some of my friends like to take jumping photos, but those usually require at least two people (one person taking the picture and at least one person jumping). The other issue is that it takes some skill to get the shot. Handing the camera to a random person and asking them to take the photos doesn’t always work out so well. Another way is to photograph a special object wherever you go. Emily sometimes brings her unicorn, Buttercup, with her on trips. This, however, means remembering to bring that object with you every time you travel. That’s why I started taking pictures of my shoes. 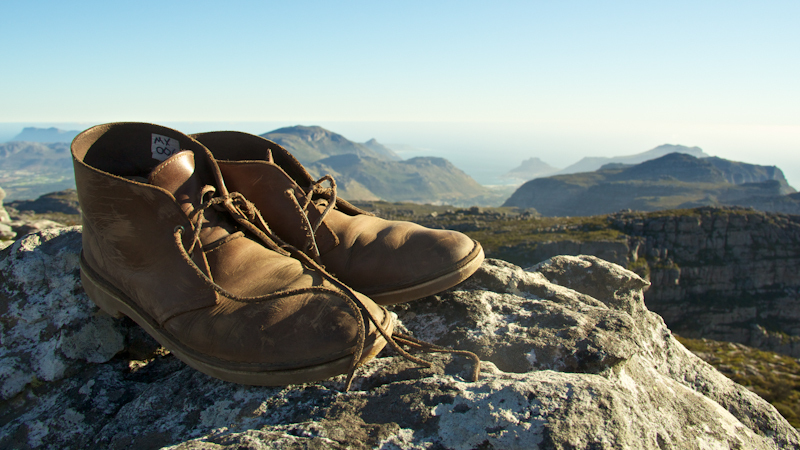 I usually take photos of them when I’ve been hiking so the shoes tie in more with the location. Whatever your special take on the photo series is, it can be a fast and easy way to visually connect all of your travels without having to buy a bunch of shot glasses. This entry was posted in Documenting Your Travels on September 30, 2013 by adamjbianchi. This entry was posted in Travel Photo of the Day on September 24, 2013 by adamjbianchi. This entry was posted in Travel Photo of the Day on September 20, 2013 by adamjbianchi. This entry was posted in Travel Photo of the Day on September 12, 2013 by adamjbianchi.